Exploring the restaurant and food scene... has become one of my favorite parts of traveling to new places and perhaps the best part for me is doing all the research beforehand, which of course I did for this trip. Thanks to Instagram, it's fairly easy to find pictures of delicious food and beautiful restaurants to venture to. 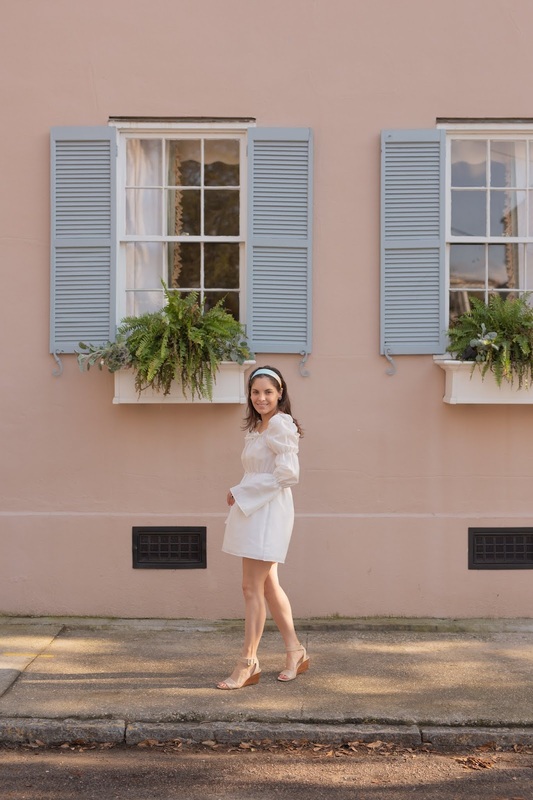 I love using the save tool in order to keep track of all the great spots that come up on my feed and my Charleston section was completely full well before I even booked my tickets! As expected, we had the best time eating our way through the city and a very hard time narrowing down all the selections! 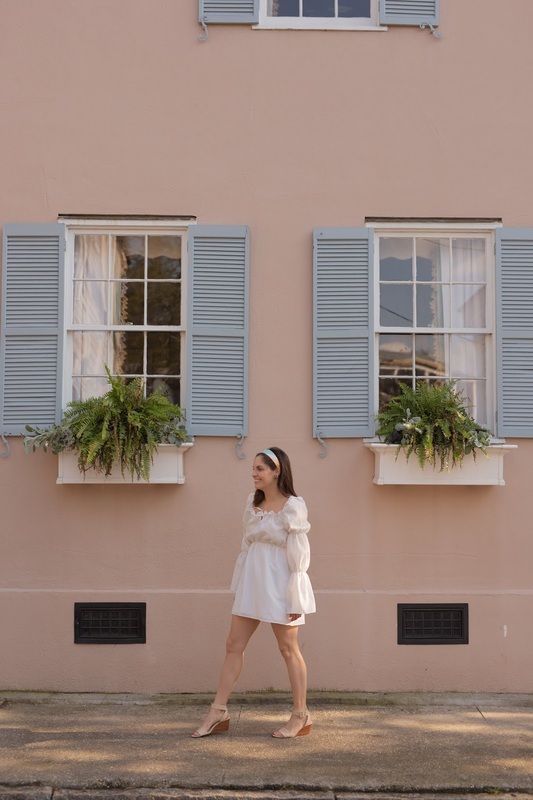 Charleston has become a foodie destination in many respects over the last 10-15 years and I certainly did not get a chance to explore as many places as I wanted to. I honestly just needed about 5 more meals there to feel complete! But we did hit a bunch of amazing spots and I can't say I was disappointed with any of them. So without further ado, our full eating itinerary. Enjoy! Friday afternoon I visited the stunning Camiella's at Hotel Bennett for afternoon tea. The tea selection was great and they had yummy little savory and sweet treats. It wasn't the most outstanding tea service I've ever had but I certainly would go back with a group of girlfriends or my mother. It's also a ladies lounge at night, a perfect place to grab a drink before or after dinner. 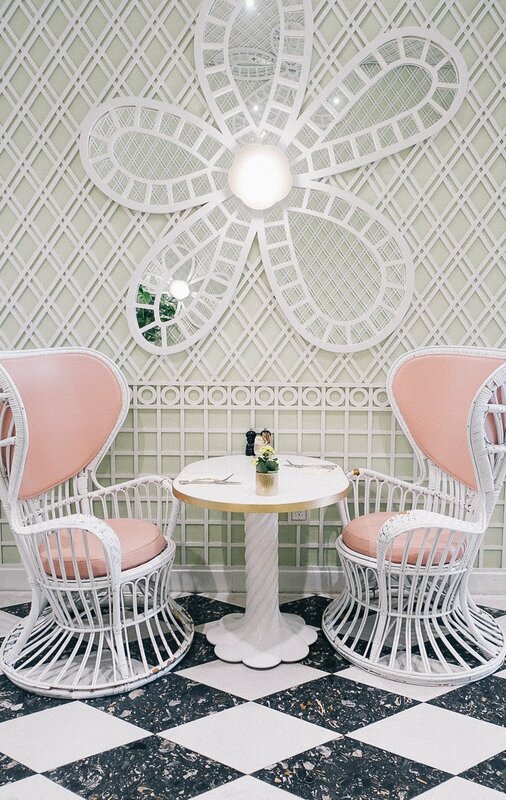 More to come on Camiella's because the decor is just beyond stunning and quite frankly deserves it's own blog post! Friday night I ordered room service at The Mills House after being just too exhausted to go out and find something by myself before my sister arrived. I must say, I was not disappointed by how delicious the fried chicken sandwich was, which checked my box for eating fried chicken in the south! The fries were actually really good as well, topping my room service food expectations exponentially! Saturday we had a quaint lunch on the porch at Chez Nous. This place is so picturesque as it's located in a small house off the main road with a big courtyard and small, cozy inside., somewhat reminiscent of a ski chalet. We had a delicious fish of the day and salad, which might sound simple but was actually really good and felt special since the menu here changes every single day. And side note, the chef has beautiful cursive handwriting, as he physically writes new menus every day! Since both of us were recovering from colds, we opted out of the extensive wine list but I know whatever they offered would have been great and paired really well with the menu. 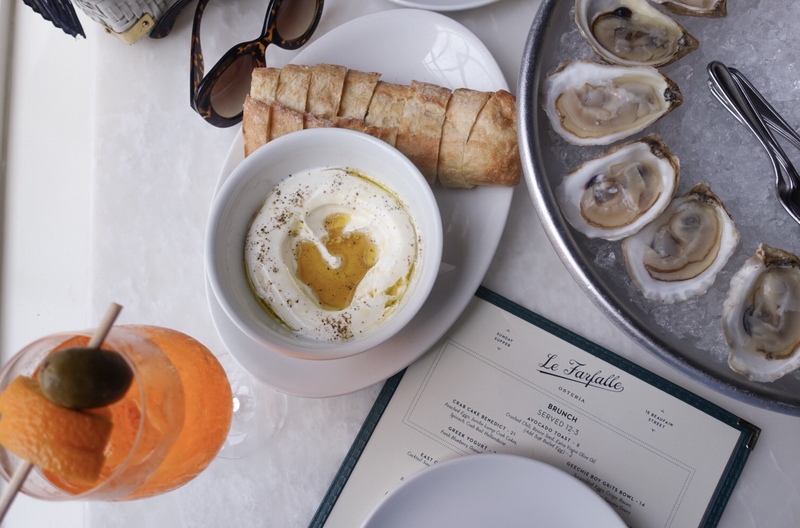 This is a great place for a nice lunch but probably even better for a romantic date night. Saturday afternoon we had a little cheese happy hour if you will at the infamous Goat Sheep Cow North, and it totally lived up to the hype! We ordered a small cheese and charcuterie plate and everything on it was outstanding. I wish we could have ordered more cheesy snacks like the mac and cheese or grilled cheese sandwich but this was meant to be a precursor to our actual dinner reservation so I held back a bit. There is nothing I love more than an opportunity for some gourmet childhood favorites. We frequented their second location in North Charleston, which in addition to having a large selection of cheeses to purchase deli style and sandwiches to go like the original South of Broad location, it also has a large dinning room and big beautiful bar. In addition to everything we had being delicious, the decor was spot on. I loved the combination of the large checkered floor and gorgeous marble bar, a design combination I am planning on taking into our condo remodel, fingers crossed. Overall, I would highly recommend visiting as a big group or small, for any cheese mouses like myself! Saturday for dinner we ventured to the well known King Street for The Darling Oyster Bar, casually known by our Uber driver as little darling, which is just SO CUTE and so southern. My sister Becky loves oysters and she was perfectly happy trying the entire selection on the menu that day. The space was very beautiful and I kind of wish we could have gone during the day so I could have seen the decor pop a bit more. I didn't exactly love the blue crab tagliatelle I ordered and definitely wish I went for the lobster roll instead but I had my skinny margarita and fries to share so I was good. Also, if you order fries and love aioli like me, request the special sauce to dip into, it's delicious and not too spicy. Sunday morning we got some lattes and yummy pastries to go at Hotel Bennett's cute little patisserie. This place is adorable and I imagine a great spot to get some work done if you have some time to kill. They had a wonderful selection of French pastries and they even make macaron towers, in addition to selling mini ones individually. Becky and I grabbed some vanilla lattes and macarons to take on our ride to Magnolia Plantation and were instantly cheered up from the rain. Sunday for lunch we headed to the highly recommended Italian restaurant La Farfelle which is yet another beautiful space with high ceilings, a clean white palate, bistro bar chairs and some beautiful navy banquettes. They also have a patio that I am sure is very pretty but due to the rain pours that morning it was out of commission. Of course Becky ordered oysters and I ordered a carbonara pasta without the guanciale and both were so good. My pasta cravings were met with happiness and even Becky couldn't help take some for herself. We also order the whipped ricotta, which I liked but we both were surprised with how sweet it was. My aperol spritz hit the spot and I would definitely come back. Sunday afternoon Becky and I headed to Zero George to have a glass of brut rosé before dinner and take in the porch life that appears to be the norm in Charleston, or maybe just the south in general. Sitting there for an hour in the afternoon really made me crave a simpler, slower afternoon on a porch type of life, until I realized how quickly I like to walk and my type A, anxious personality that I am not that equipped to change at this point in my life. But regardless, Zero George is a perfect spot to soak in an afternoon with some refreshments and also another beautiful place to have dinner. Their dinning room looked very quaint and romantic, so I would certainly put that on my list for next time. For our Sunday dinner and our last meal together, we ventured to what everyone has unanimously described as a the best barbecue place in Charleston, Lewis Barbecue. For the majority of the weekend, I had planned for us to go to Leon's Oyster Shop, but then realized they weren't known for barbecue and given that I had my fried chicken moment already and Becky had likely eaten enough oysters for one weekend, we decided barbecue made the most sense. So it was Lewis's but then one Uber driver recommended Rodney Scott's BBQ, another Bear E Patch Cafe, Willie Jewlls Old School BBQ or Bessinger's, I was completely unsure. So en route to Rodney Scott's, our next Uber driver convinced us that Lewis was the still the best so we redirected our ride and ended up there after all. I wish I had more meals to try out all of them, but perhaps I will just have to come back and do a barbecue tour of the south. Lewis did not disappoint and was delicious! They didn't have chicken but I loved the turkey and my sister was very happy given her high standards after having lots of barbecue experiences in college. My favorite part, however, was hands down the mac and cheese! I can't explain how delicious it was, all I can say is that it's the best I have ever had, hands down. And I have had my fair share of mac and cheese! I would actually go back just for that, my sister had to coax me out of ordering a second portion! Worth the hype! Monday morning I didn't have much time before my 1pm flight back but I did get a chance to stop at Sugar Bakeshop for a cookie to go on the way to the airport. I grabbed a ginger molasses and chocolate chip for Arthur and had the gluten free chocolate chip myself to pair with my latte while I waited for my flight. They were all spectacular and Arthur was very happy when he picked me up and the airport and received his little treat. Overall, a weekend well fed! These were all the places we tried out ourselves, but I have lots more places to recommend in my Charleston Guide, coming soon. I visited Charleston... for all the common reasons most Americans do. The historic homes, delicious cuisine, charming and colorful streets, the experience of being in a place that despite it being the year 2019 takes great pride in conserving the character and history of a place with deep, old American roots. A place that appears to be consistently praised for and perhaps also haunted by its history. So when coming to visit for the very first time, those same roots that created these pastel colored homes and shutters I knew would flood my Instagram account, also unfortunately represented some of our country's most shameful narratives. The word roots itself always takes me back to a few days in middle school when my classmates and I watched what felt like hours and hours of the 1977 mini series Roots. I remember those days so very clearly because it was the first time I ever was exposed to the concept of slavery at this magnitude. Of course I had learned about the slave trade, colonialism and the plantation model in history classes before, but the impact of what I learned in books just did not compare to seeing the story with my own eyes. To be honest, it was really scary, what the therapist in me would label a secondary or vicarious trauma. And let me preface this by saying, that for me to even say I was somewhat traumatized by watching a fictionalized story of slavery, is a privilege. The reality is that so many Americans' ancestors lived it and these narratives have passed down not just amongst enslaved peoples but also those of the South. It's impact is far reaching even beyond the constraints of the Mason-Dixon Line as slavery impacted all areas of American life. When I think about what that impact means today the term intergenerational trauma rings a bell. The concept that we ourselves can be impacted and suffer as a result of the suffering and traumatic experiences of those who came before us. That suffering and the effects of suffering, can be passed down. 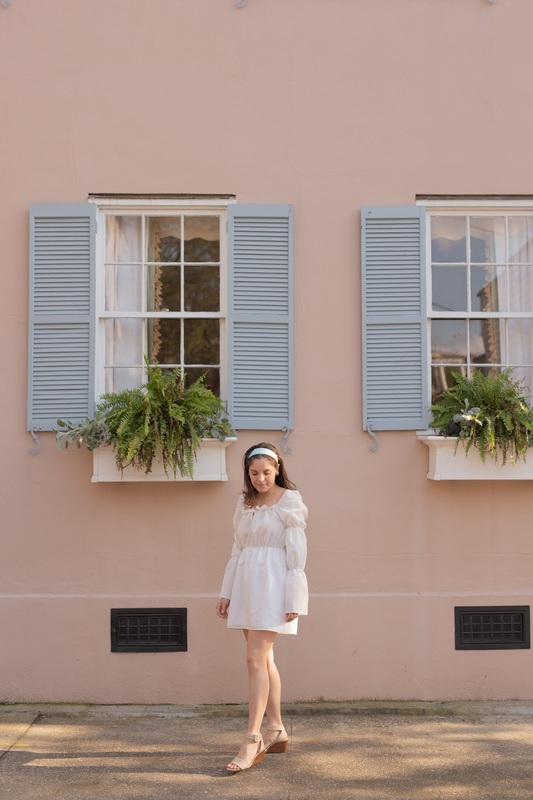 Traveling through Charleston was as beautiful and charming as it felt heavy and wrought with my own unresolved feelings about our nation's history. So much of what I loved about my visit had major ties to the contributors of West African and Caribbean culture- the music, the cuisine, the landscape, the architectural details, the lemongrass baskets I couldn't stop swooning over. When we pulled into the Magnolia Plantation and toured the slave grounds I felt a smidge of what life must have been like to be so far away from home, or to call something home because it's all I ever knew without having any real ownership or rights to. To be somewhere where you aren't free. I know that despite the incredible horror and hardship slaves endured, there was a large amount of real spirit, an inner connected source of strength amongst a group of people that had no choice but to overcome suffering. I think that is something that all Americans can relate to in coming to terms with the narratives that got us here, despite the differences in how we all experienced our shared history. Even those of us not directly related to slaves or slave owners, have been impacted in some way or another by these tragedies. I also know that despite slavery being abolished, the impact of having kidnapped, abused and exploited a people didn't just end there. No matter where in the country we are the impact is often pretty clear, we still have severely immobilized many African Americans and Black citizens with the continued impact of Jim Crow laws and now extremely disproportionate incarceration rates. Economic and educational opportunities have certainly improved over time, but at a much slower rate than most other groups. So as a I walk through the places where so much history happened, I can't help but feel some of the weight of what it means for myself as an American. I will always believe in the power of progress and I believe we have certainly made so much already. What I would like to see more of is just simply an acknowledgement of what has transpired, the ability to recognize the systems of power that have both caused and resolved a lot of the world's traumas. By walking through these streets I felt a weird sense of balance, seeing that there was acknowledgment and thoughtfulness about where we were and how we arrived there. I felt pride in knowing I was also one of those people, someone who walks through the world not pretending to know everything, because I don't, but as someone who acknowledges the truth. Someone who's curious and cares about knowing. They say ignorance is bliss but I think authenticity is everything. How else would I be able to sit here on this porch, enjoying the sweet drinks, kind people, beautiful homes, slow pace, without acknowledging the suffering that came before, and probably still exists in some form or another. After all, what are we made of if not our stories? Aerin Lauder has remained a style icon... of mine for many years. She is one of those people who just has it, if that makes sense. And by it I suppose I mean she has a natural eye for beautiful things and places, a seamless sensibility that translates simply. That is perhaps my favorite style, effortless chic. So of course I’ve always admired her own products and made mental notes to visit her gorgeous boutiques in The Hamptons and Palm Beach. When I finally caught wind of her shop in Los Angeles, located of course on the very fashionable Melrose Place, I immediately made a visit a top priority. Once I arrived I was informed that the shop was in fact only a pop-up, making my trip there all the more special. I was extremely impressed, but not too surprised, that the space appeared permanent grade with beautiful decor and a stunning outdoor setup that I’d like to spend a whole afternoon at. The shop is a collection of Aerin’s pretty perfumes, candles and trinkets, with the welcomed addition of all her curated finds from other amazing designers. 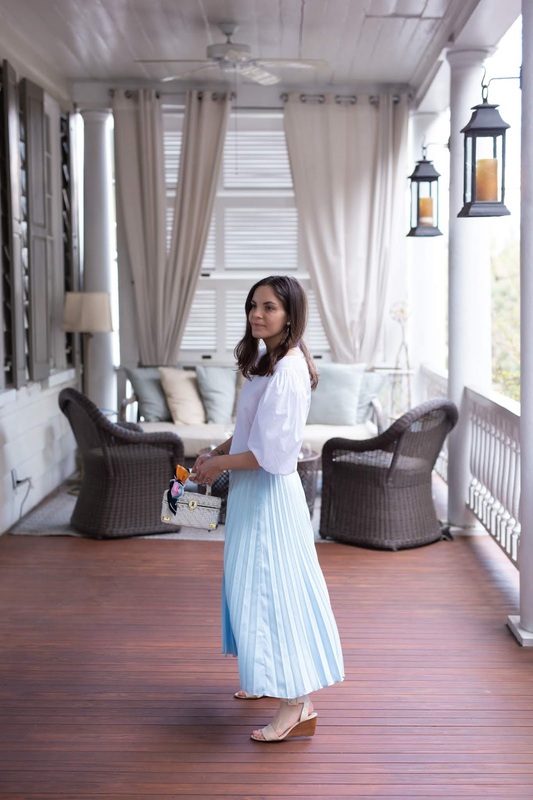 I love how easily everything she has collected for this shop comes together and it is easy to see how her relaxed, yet always upscale sensibility shines through. So if you are in the Los Angeles area before April is up, I highly recommend you pay a visit! I've linked some of my favorite online items from all the many retailers that carry her products-particularly the collaboration with Williams Sonoma that I still can't get over. Enjoy! I've been searching far and wide... for a dress like this with THESE sleeves! I'm obsessed with the puffy, multi-gathered sleeve, which is actually called a a Marmaluke or Virago sleeve for anyone as obsessed with this style as me! 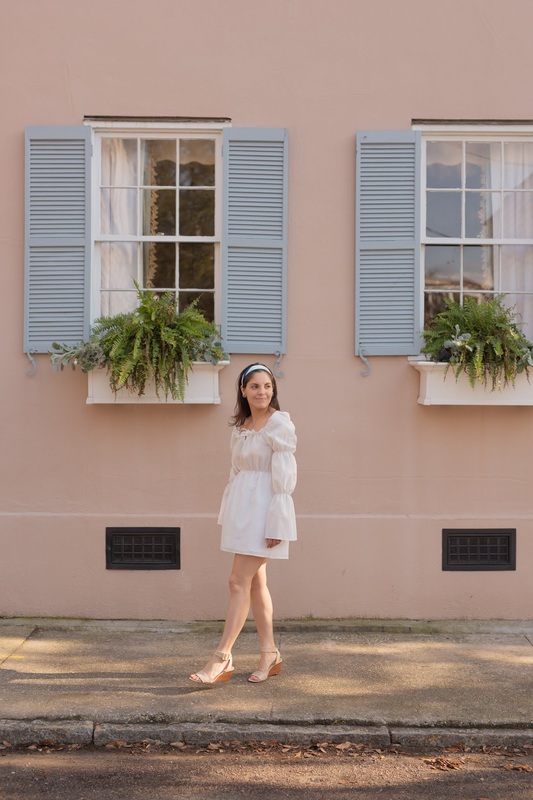 As you might already know, I am always on a continuous, year round search for the perfect little white dress, a timeless staple in my closet and an item I don't think I will ever be done with. There is just nothing that can top a clean, white ensemble in my book; it's basically my version of the little black dress. And even though Labor Day hasn't happened yet, this is a perfect way to prepare ahead of time or just break the super lame and irrelevant rule. So the second I purchased this dress, I right away mentally packed it in my suitcase to Charleston. 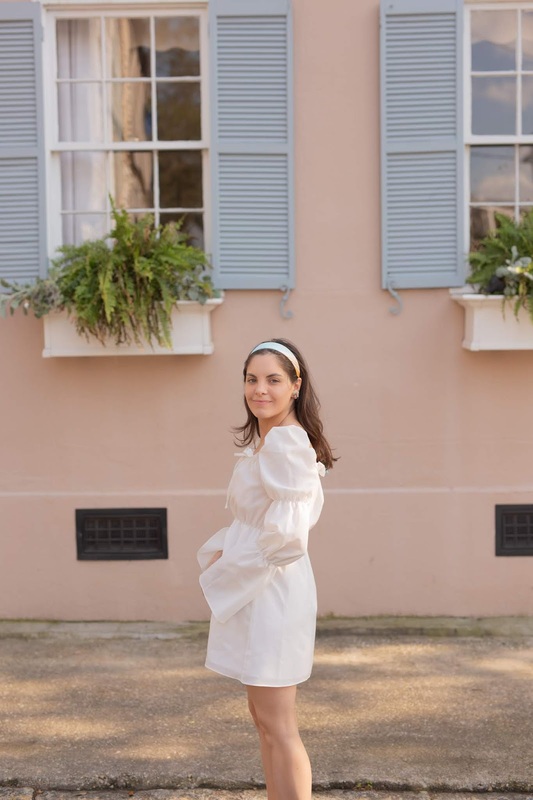 My sister and I went last weekend for a girls trip to celebrate my getting married this year and so wearing a chic white number was certainly in the cards. Unfortunately, the rain took over for the majority of our trip but I was able to shoot it in front of the most perfect home in Charleston with the lovely and extremely talented photographer Gladxia Mari! 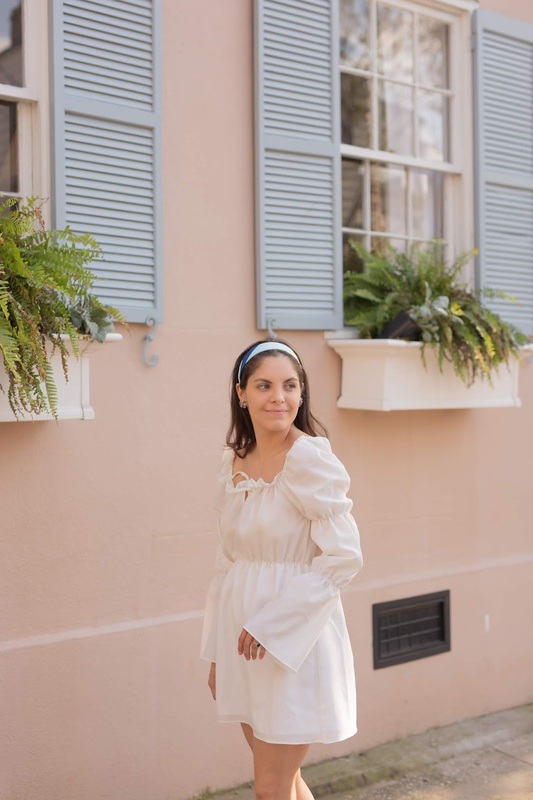 To top off the crisp white I added a chic headband I found in store at Forever 21 recently. 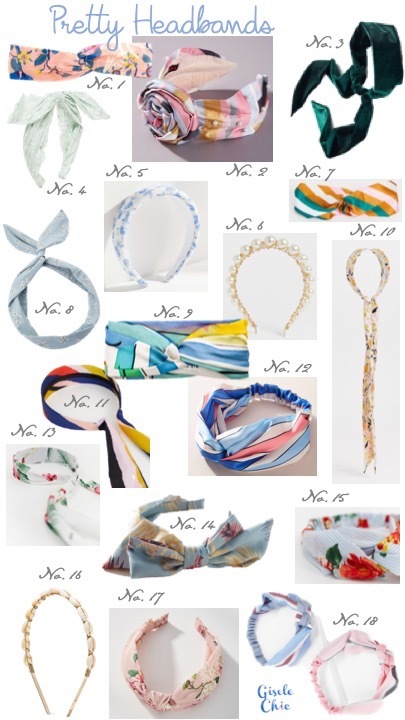 I can't find the exact headband I purchased on their website, however, I figured I would link all the beautiful options given this amazing headband trend that I am so on board with at the end of this post! More to come on my trip to Charleston soon, enjoy!